We can build any size, any shape upholstered headboard you choose. 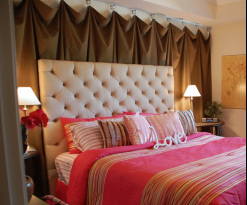 Headboards are an easy way to add drama or update the look of a bedroom.  From custom upholstered cornice boards to drapery fabrics, Magnolia Upholstery & Fabric Gallery has what your windows need to frame those beautiful Lowcountry views. Change the look of a piece of furniture seasonally with a custom-made slipcover in your favorite fabric. Cushions can get worn over time and lose their shape. 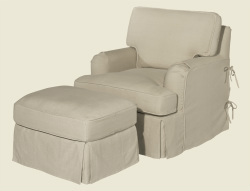 Have Magnolia Upholstery bring them back to life with new foam or have new cushions entirely remade. Consider a contrasting fabric and throw pillows for a designer look. Update patio furniture with brand new cushions in an outdoor fabric. From broken springs to broken legs, furniture may be damaged but don't throw it out until Magnolia Upholstery has given you a free estimate on furniture repair. It may be possible to save your favorite piece. The upholstery experts at Magnolia Upholstery & Fabric Gallery can even give your marine cushions new life and a fresh updated look. We can handle any size commercial job. Churches, hospitals, movie theaters, restaurants... Call today for an estimate. Have a unique design in mind? 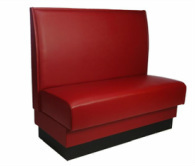 Our craftsmen can build and upholster any custom piece to your specifications. Click here for some examples.